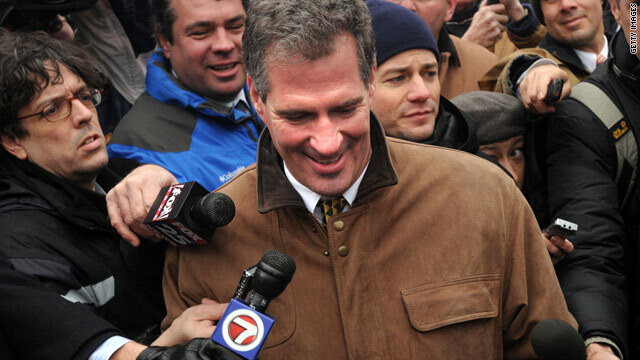 Republican Scott Brown has been capitalizing on voter anger. (CNN) -- For weeks, he was the underdog candidate, running behind in the race for the U.S. Senate in Massachusetts. But today, Republican Scott Brown could deal President Obama his first defeat in the 2010 congressional elections. Trailing by double digits a little more than a week ago, Brown has edged ahead of Democrat Martha Coakley in the race to fill the late Ted Kennedy's Senate seat. Brown, a state senator, has campaigned as the pickup truck-driving candidate, capitalizing on voter frustrations and vowing to send Obama's health care bill "back to its drawing board." Coakley, the state's attorney general, had been considered a shoo-in, but now her party is desperately trying to keep a pivotal Senate seat from slipping away. "This was supposed to be a walk. It's fairly incredible that here we are ... and Ted Kennedy's seat is actually up for grabs," said Scott Helman, political editor for The Boston Globe. Helman attributed the closeness of the race to two things: "I think Coakley's campaign operated for a long time as if this was going to be a fairly easy race; and two, Scott Brown's campaign has done a very good job, capitalizing on anger at Washington, anger over health care, anger about the deficit, the sort of throw-them-out mentality," he said. A GOP win in Tuesday's special election would mean that Democrats would lose their 60-seat, filibuster-proof majority in the Senate, jeopardizing much of Obama's agenda, including health care reform. Coakley's been criticized for running a lackluster campaign and not fighting hard enough for the seat. Massachusetts is considered a Democratic stronghold, but, by most accounts, Coakley has been unable to fire up her party. Hoping to revive her sputtering campaign, Obama and former President Bill Clinton joined Coakley on the campaign trail. "If you were fired up in the last election, I need you more fired up in this election," Obama urged a crowd at a Coakley campaign rally Sunday. Supporters say Coakley is the best candidate to carry on Kennedy's lifelong fight for health care. Kennedy, known as the liberal lion of the Senate, died in August of brain cancer. For the past three years, Coakley has been Massachusetts' attorney general. She previously spent eight years as the district attorney for Middlesex. On her campaign Web page, the Democratic candidate points to her 20-year career in public service and her commitment to advocating the best interests of Massachusetts. Heading into the race, few political analysts believed Brown had a serious shot at beating Coakley. Brown was underfunded and unknown statewide. No Republican has won a U.S. Senate race in Massachusetts since 1972. Democrats control the state's congressional delegation. They also hold the state's governorship, along with overwhelming majorities in the state legislature. But Brown, who is in his third term in the state Senate, has charged forward on a pledge to end wasteful government spending and hand politics back to the people. Donahue said that was the game changer for Brown because Coakley "didn't have an effective answer against that." More so than a statement on the candidates' strength and weaknesses, it's discontent among voters in Massachusetts that is driving this election, said David Gergen, a political analyst and CNN contributor. "Scott Brown has turned this into a referendum on what's going on in Washington, especially with health care. His campaign began to gain traction when he said that, 'I am going to be the 41st senator, the one who can stop a lot of this,' " Gergen said. John Avlon, author of "Independent Nation: How Centrists Can Change American Politics," says in the end, the results of Tuesday's election rest in the hands of independent voters. Democrats far outnumber Republicans in Massachusetts, but there are more independents than Republicans and Democrats combined. "Independents are going to decide who wins this election, bottom line," he said. "Independents asserting their real power even in Massachusetts should be a huge wake-up call to Democrats and Republicans." But no matter what the outcome, Avlon said this shouldn't be viewed as voters turning on Obama. "I don't think it's a referendum on Obama necessarily personally, because he is still personally popular with many independents. It's the Democratic Congress that's being reacted against.